Tag Goulet is co-founder of FabJob.com and author of the FabJob Guide to Become a Motivational Speaker. If you have ever made a class presentation, spoken up at a meeting, or given a toast at a wedding reception, you have spoken in public. Since public speaking is many people’s greatest fear, if you enjoyed the experience, you might have what it takes to become a motivational speaker. From the storyteller around the campfire to great spiritual and political leaders, speakers have motivated people throughout history. Today’s motivational speakers inspire students to stay in school, say no to drugs and gangs, and prepare for life after graduation. Adults are motivated by speakers to follow their dreams and achieve greater success in business and in life. The first place to look for what to speak about is your own life. Make a list of the goals you have achieved, such as: graduating from college, landing your first job, finding someone to love, overcoming a bad habit, starting a business, raising children, or achieving a lifelong dream. Of course, it’s even better if you have achieved something extraordinary, such as winning an Olympic medal, publishing a bestselling book, or giving birth to septuplets! But even accomplishments that seem “ordinary” can provide material for speeches. People find it inspiring to hear about how others have overcome obstacles to achieve their dreams. If you have ever had to deal with fear, rejection, financial hardship, or loss along the way to achieving your goals, chances are you have the basic material to give a motivational speech. Unfortunately, unless you’re already famous, audiences won’t pay just to hear about your life. (Many people are happy to talk about themselves for free!) To be successful, you should identify how your speeches can help people solve their problems, achieve their goals, or otherwise improve their lives. People are unlikely to take you seriously if you promise that your speeches will solve all their problems and help them: get rich, lose weight, find the love of their life, become great leaders, get healthy, make more sales, be happy, etc., etc. Instead, pick one specialty or “niche” such as leadership. It’s important to have a niche because people like to hire experts. After all, if you needed surgery, wouldn’t you want your doctor to be “an expert”? It can be tempting to say “I want everyone to hear what I have to say!” The reality is that if you develop a speech bank executives love, chances are it won’t go over as well at the local elementary school. Depending on your niche, you could define your audience by characteristics such as: age, gender, geographic location, industry, interests, or any other traits that distinguish one group from another. Once you have identified your audience, you can target your efforts directly to that group. If this is the part of becoming a speaker you fear most, the good news is there are people who can write a speech for you. You could check the Yellow Pages and hire a speechwriter, public relations firm, or speech coach. Prices can vary widely, so ask for a flat fee quote. If you want to write it yourself you can find numerous online resources to help you. There are numerous excellent speechwriting websites including sites offered by communication departments of several universities. It’s fine to feel nervous when you first start speaking. But as a professional speaker, it’s your job not to let it show. Among the traits that can help you succeed as a speaker are confidence, credibility (a combination of likeability and expertise), and enthusiasm. Most colleges and universities offer evening classes in public speaking to help you develop these traits. Another idea is to join Toastmasters, an international non-profit organization that helps people to practice speaking skills at weekly meetings. Once you have written your speech and are confident in your speaking skills, you’re ready to start marketing yourself to the people who can hire you. Your promotional materials include a “demo” video and an information package. While professional speakers spend thousands of dollars on a demo tape, as a beginner, your demo tape can be as simple as a video recording of one of your speeches. Your information package can be a two pocket folder available from any stationery store. It includes such items as: a letter of introduction, a business card, your resume, a color photograph, a page summarizing your experience and the benefits of your speech, and testimonial (reference) letters from people who have heard you speak. To make my package stand out, I also like to include a small gift related to my speech, such as a postcard with an inspiring message. Potential employers of speakers include: seminar companies, conventions, conferences, trade shows, corporations, non-profit associations, government agencies, continuing education departments, schools, colleges, and cruise ships. One of the best ways to approach potential employers is by phoning or emailing them an invitation to see you speak. If they can’t come to see you in person, the next best thing is to send them your materials so they can see you on tape. Imagine if employers approached you, instead of the other way around. You can make it happen by becoming well known in your community. The most effective ways to become well known as a speaker include: get interviewed on radio and TV, write articles for publication in local newspapers and magazines, put up a website, attend networking events, give free speeches to community groups, and present your own seminars. Speakers bureaus are companies that can find work for you. Once you have some experience as a speaker, you can start approaching bureaus in your community to represent you. 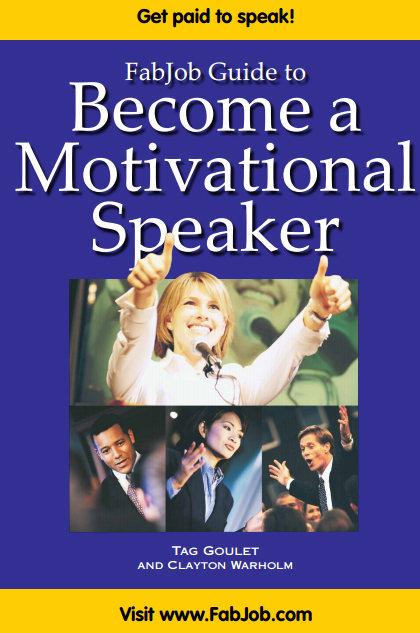 This article is a small sample based on the FabJob Guide to Become a Motivational Speaker. The complete guide offers detailed information about how you can break into motivational speaking and get hired as a motivational speaker. Click on the cover above or visit www.FabJob.com for information. How Do You Set Consulting Fees? Forex vs. Stocks: Which Investment Option Should You Opt For?